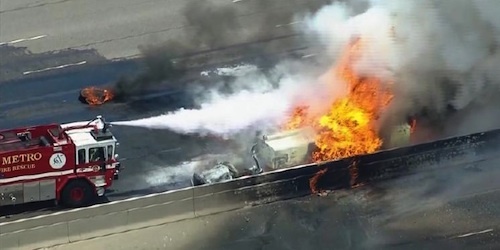 A fuel tanker driver is thankful to be alive today after his truck caught fire on a busy Denver freeway and exploded in a massive inferno. It was his own quick thinking and several witnesses springing into action that ultimately saved this driver's life. The incident occurred just before noon on Wednesday in the northbound lanes of Interstate 25 near Denver Tech Center. While it’s still not clear what initially caused the truck to start fire, investigators say a blown tire may have caused it to crash into the concrete median before erupting in flames. One of the witnesses, Dave Fretz, told local media that he was driving his pick-up in the number two lane and first noticed a CDOT truck stopped beside him with its flashers. Then he saw the fuel tanker up ahead of him making a 90-degree turn and crashing into the median. “When he came to a stop I could see fuel on the road northbound. It was smoking and I saw there was some flames happening in the back part of it,” Fretz described. “I knew this guy was in a truck and I didn’t see him come out of the truck.” Fretz immediately put his pickup truck in park and ran toward the tanker. "I don’t know, I don’t know what it was, I just was thinking about him 'cause I knew he had to still be in there," he said. Fretz dodged through the flames to get to the truck but when he got to the driver’s side, he couldn’t see any sign of the driver. Fortunately, the two CDOT workers who happened to be working in the area at the time had noticed the tanker driver was in trouble and immediately ran to assist the driver within seconds after the truck crashed. 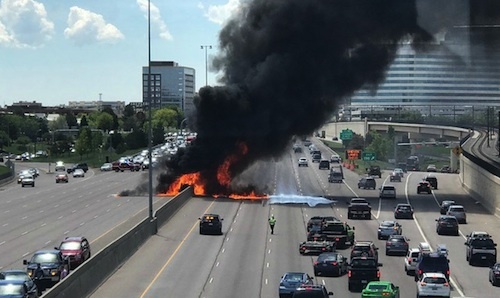 It turned out the driver had jumped out the passenger’s side himself and the two CDOT workers helped rush him away from the scene and put out the flames on his pant leg. The driver was also bleeding from injuries but medics with a private ambulance company also happened to be sitting in traffic at the time and immediately began treating him. Fretz said it was just a few moments after they got the driver to safety that they heard the explosion. 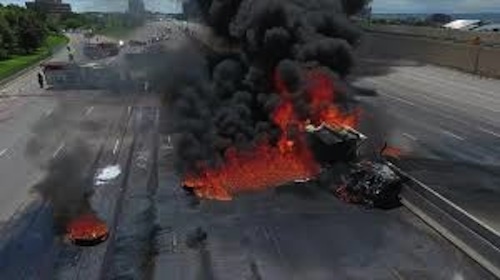 Then a series of explosions that completely engulfed the tanker and part of the Interstate in flames. “Heard this ‘kaboom!’ I turned around and the truck, you couldn’t see the truck anymore, black, black, black smoke, the highways both north and southbound were on fire. There were probably about four or five booms after that,” he explained. The black smoke billowed high above and could be seen for miles around. The interstate was closed for hours from Dry Creek (exit 196) to Belleview (exit 199) as firefighters performed the tough job of extinguishing the flames and HAZMAT workers cleared the roadway of toxic chemicals. More than 200,000 vehicles had to be diverted from the scene until all lanes were finally reopened 5 a.m. Thursday.